Saturday was the long-awaited day! After knitting and sewing in every spare moment for weeks, I was finally ready to fill a table with my wares and see if people would buy. The location of the craft fair was flooded with light and so beautifully decorated! 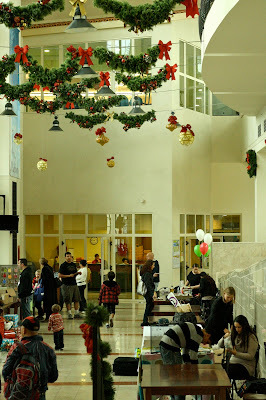 Since there were several other events going on around base at the same time (Breakfast with Santa, Winter Wonderland crafts for kids, and the Relief Society gift sale, among others), the hall was filled with people going to and from events and stopping in to buy Christmas presents. I shared a table with my sweet friend Anna, who is the woman behind BB&J Bakery. She designed all her own patterns for chef hats and play food made out of felt. Her stuff is sooo cute, as everyone thought as they walked by our table! 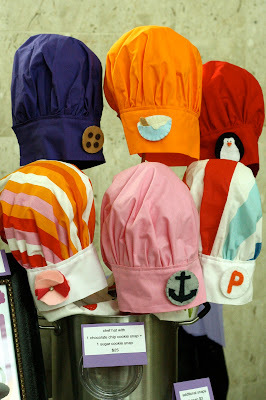 Each of her chef's hats has a little snap on the front; she sells darling interchangeable snaps. And here is some of her felt food... pretty enough to eat! It was fascinating to watch what people gravitated towards and then what they eventually bought. For instance, everyone loved the felt baby shoes, but I only sold 3 pairs in the end. Meanwhile I had just 3 pairs of fingerless gloves to display (too many Christmas orders and not enough time to knit more!) but ended up selling 5 pairs total thanks to several custom orders. Other popular items were the bean bags and tooth fairy pouches, which I had never made or tried to sell before in my Etsy shop and thus were a bit of a gamble. Looking back now, I'm so glad I decided to sell at the fair and then threw myself into it. As I said in an email to my family the other day, "Most importantly, I had a blast. I've wanted to sew and knit a lot of things that I made for the fair for awhile but just haven't motivated myself to do it. Yet now for the last 3 weeks I've been knitting and sewing in every spare moment. And I loved it. I got such a kick out of watching simple and beautiful things form quickly in my hands, and it made me so proud to sell those things and receive the affirmation for my [art]work." And that's what really counts! Later this week I'm going to publish a post with a few things that I learned at the craft fair, such as what supplies you shouldn't leave at home. At the very least this will be a resource for me for the next craft fair (because there will be one! ), but hopefully it will be a help to my fellow crafters, too! So glad it went well and you had fun! that felt food is the cutest! 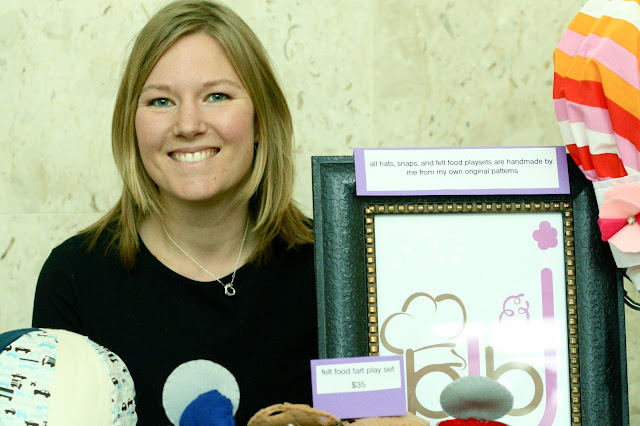 such fun to see the variety of items you made and sold! makes me well up with happiness, dear daughter! i'm so impressed!! and everything was so reasonably priced, i would have bought the whole table!! That's my incredible crafting wife! I can attest to all the hard work that went into each and every item, but I can also honestly say that she enjoyed every minute of it. wow how talented are you!! and i love the stuff your friend made too, i hope you had a successful day! The baby shoes are adorable! But how do they stay on baby feet? Just curious. And the silk/mohair scarf sounds luxurious! And you picked gorgeous colors for it. WOW! 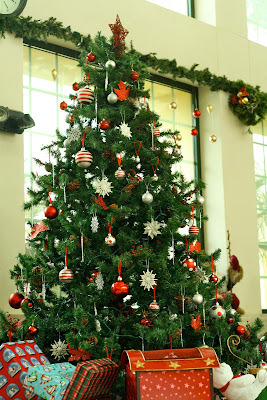 Creative and beautifully made - love it all. So proud of you, B! Oh man, this is so cool! I kept checking back this weekend to see if you updated how the fair went! So great of you for just getting in there and doing it. Also, the first picture of you with your table and your bump-- so cute. This inspires me to learn to knit/crochet/craft/something! Good for you! Your table looks awesome! And those felt baby shoes sure are adorable! What a great first craft fair!! So awesome that you got some future orders too! Your knits are just lovely. Anna's felt play food is just so cute! I love the tooth fairy pouches - everything is so sweet and done so beautifully! 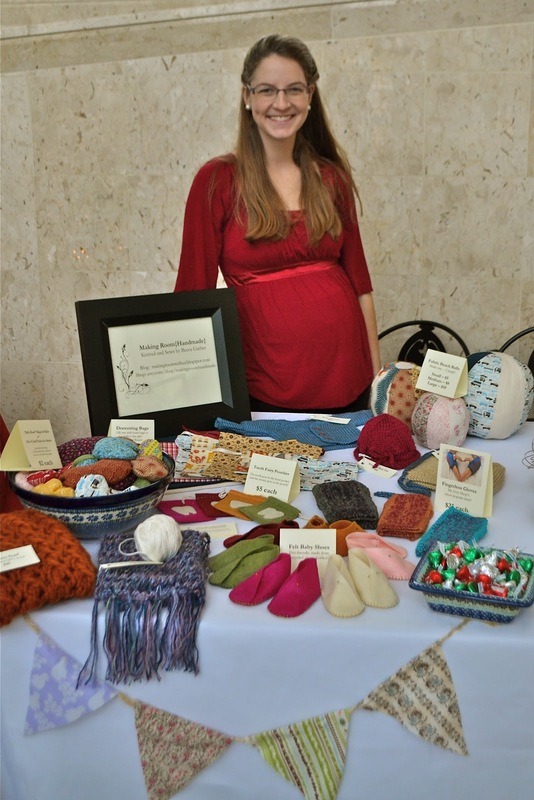 congrats on your first craft fair!